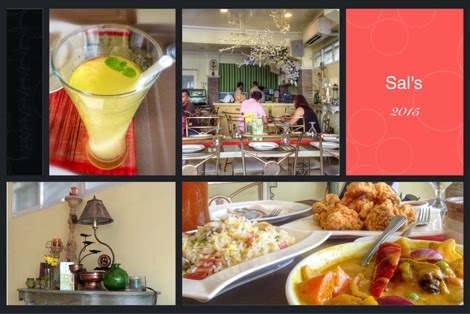 Living Leyte : Sal's : for Grown Ups? Sal's : for Grown Ups? Sal's is located in Burgos, exactly under a resto-bar named Capitan Tiago. The clientele when we had lunch here anyway, were business gents and ladies and Korean investors. Wheeling and dealing were being discussed though suited to our island town scale. The eavesdropping was not intentional because the voices were really audible. The menu consists of mainly Filipino dishes, the ones we are familiar with but are prepared and adorned richly. The pineapple which is a universal symbol of hospitality is a part of this restaurant's design-scape and logo. The decor is an eclectic mix of glass, ceramic and flickery lights. I was taken with the buttered chicken which is of course fried, therefore fatty but was light! How is that possible? It would also be good to note that Sal's is a franchise straight from the soul of Ormoc (which explains the pineapples), if this sounds familiar, it's because this is from that Sal's with the charming circular, al fresco dining restaurant close to the heart of Ormoc City. Just check out Sal's when you have the time if you haven't already and wear your grown up suit because, though they have color and a friendly ambiance, the guests can be... serious.